“Getting the job done wherever, however, no matter how big or small.” That’s our mission at Waller Heating & Air Conditioning. 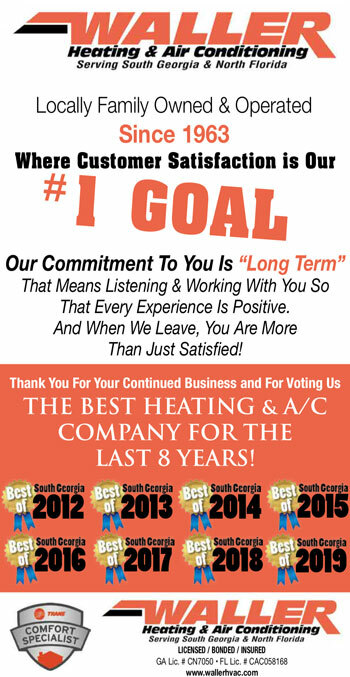 As an award-winning Trane Comfort Specialist, we’re ready to meet your needs with top-quality heating and AC service. We specialize in repairs, replacements, and new installations for residential and light commercial or small business HVAC systems. Since opening our doors in 1963, we’ve expanded our service areas to include communities throughout South Georgia and North Florida. The weather in the community nicknamed Azalea City, is great for plants for most of the year. However, you don’t want those temperatures indoors. Your indoor comfort depends on a well-functioning HVAC system. Our NATE-certified service technicians provide the repair, maintenance, and installation services you need for year-round comfort. Our unrivaled expertise has earned us several Top Ten Dealer awards from Trane. Call us today to learn more about our services. In downtown Thomasville, Georgia, with its historical heritage homes and centuries-old oak tree, the past is always present. When it comes to indoor comfort, however, only the most modern HVAC equipment will do. Our state-of-the-art HVAC systems save you money while enhancing your comfort. You can trust Waller Heating & Air to keep you cool in summer and toasty warm all winter long. Give us a call to schedule service. The community of Quitman, Georgia, is well known for its southern hospitality. Our service technicians work hard to keep your home comfortable and welcoming. As the area’s only independent Trane Comfort Specialist, we offer the best HVAC systems in the region. Our staff of more than 45 employees means we are readily available whenever you need us. Call us to learn more about our services. Small-town charm and plenty of outdoor activities make Adel, Georgia, a great place to call home. Dependable HVAC products and services make life in Adel even more enjoyable. As the region’s leading heating and AC contractor, we offer quality installations, repairs, and preventive maintenance. No matter how big or small the project, our 100 percent satisfaction guarantee ensures that you’ll be pleased with the results. You can schedule an appointment by giving us a call today. Best known for its beautifully landscaped Four Freedoms Park, Madison, Florida, is a place that cares about tradition. At Waller Heating & Air, we’re proud to keep the city’s homes and businesses comfortable year-round. Our NATE-certified service technicians have the expertise and experience it takes to master every project. Whether you need a new installation or an emergency repair, call us for all your comfort needs. With its numerous festivals, and outdoor art installations, Lakeland, Georgia, invites exploration. After a busy day in The City of Murals, our heating and AC services provide the indoor comfort you crave. As your Trane Comfort Specialist, we’ll make sure you enjoy products that help you save energy and money. Our 24/7 emergency services ensure that we’ll be there for you when it matters the most. With two locations to serve you, Waller Heating & Air is always ready to meet your needs. To schedule heating or AC service, feel free to give us a call at any time. Our factory-trained service technicians are ready to serve you.